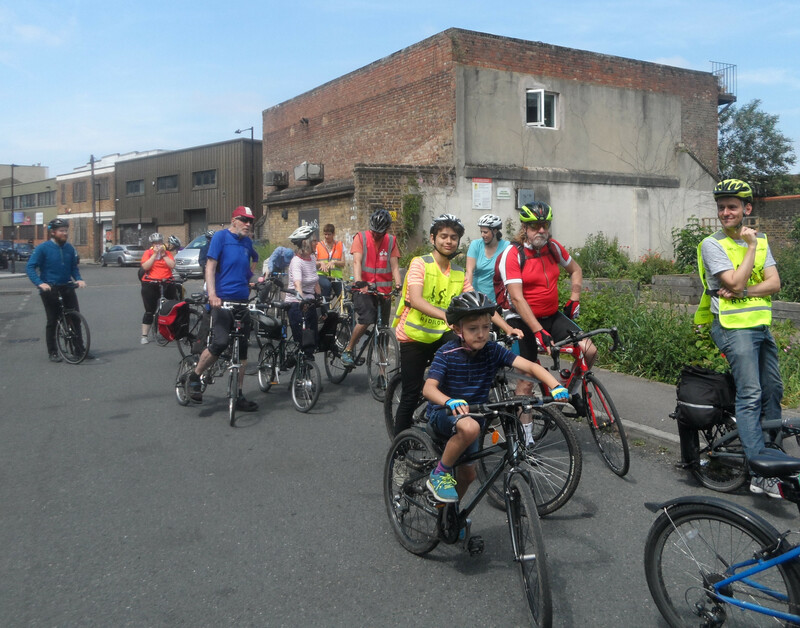 Distances: If you return direct from Finsbury Park to Islington Town Hall it’s about 13 miles, Hampstead Heath 18 miles, Sidings 24 miles. 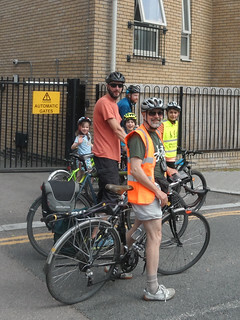 As usual I started at Sidings Community Centre. 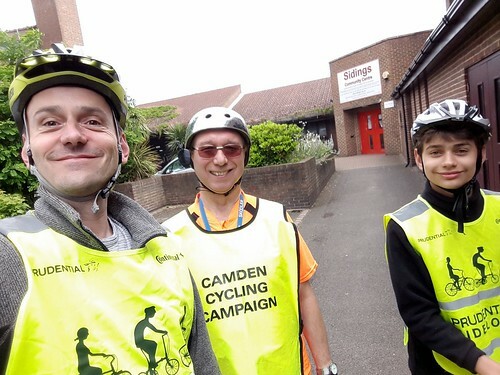 Morten and Oliver joined me for the 30 minute ride over to the second meeting point, the Hampstead Heath tennis courts off Highgate Road. 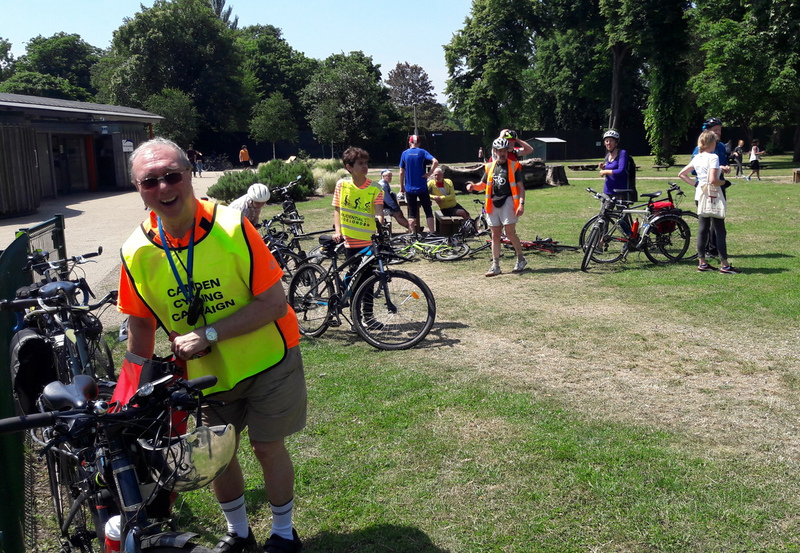 There we met up with John, Ellen, George, Jean, Simon, Diane, Luke, Will, Nicola, Suzanne, Peter, William and Clara, 13 adults and 3 young people. 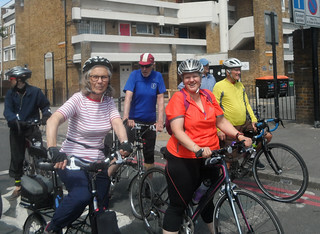 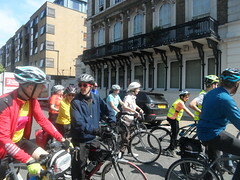 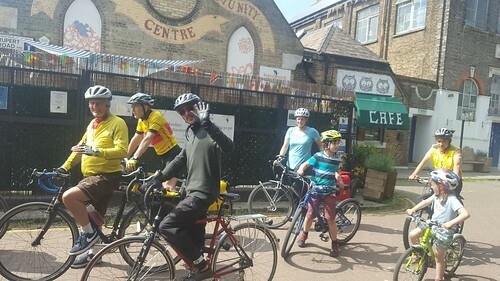 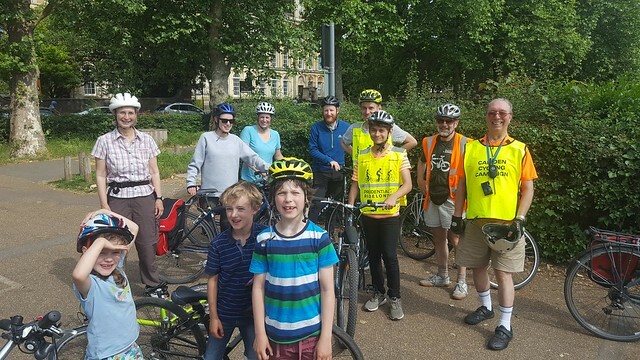 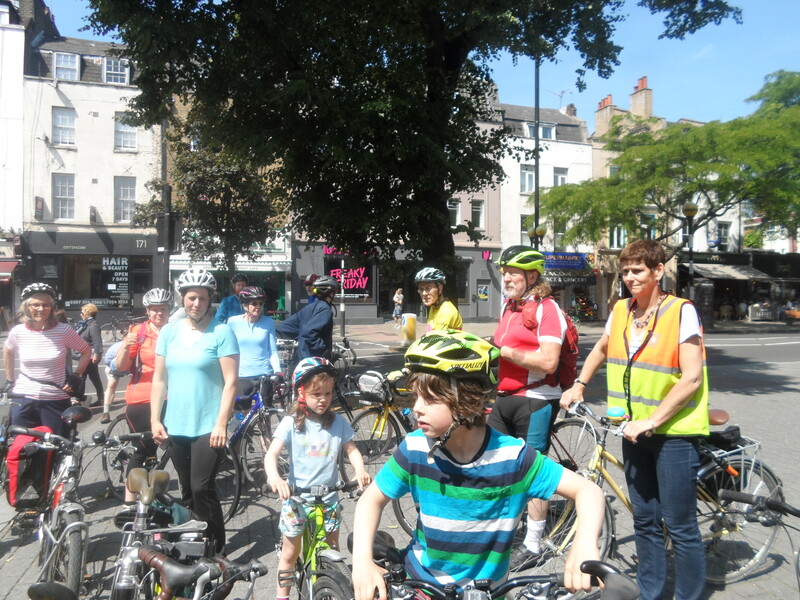 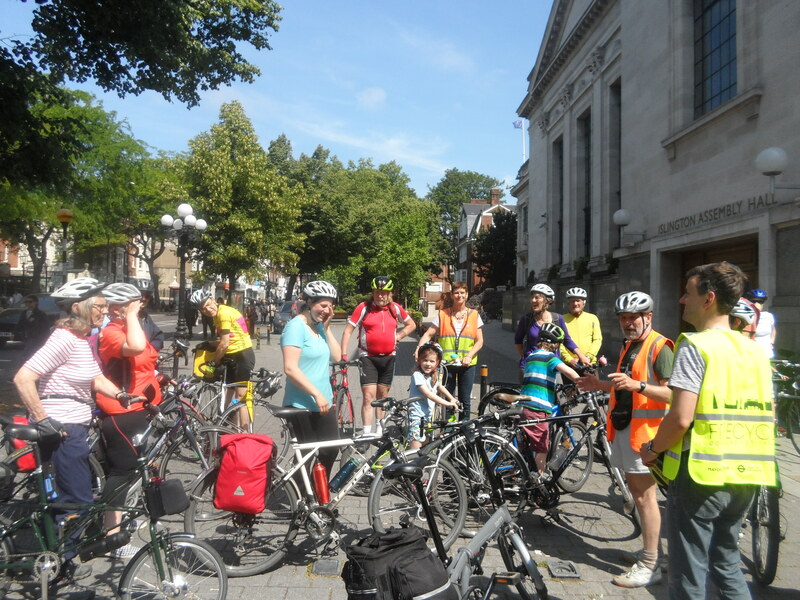 John led us over the usual route through Tufnell Park and Caledonian Park to Islington Town Hall where we met another 6 adults and 1 young person: Chris, Eilidh, Sue, Egil, Sam, Miri and Sylvan. Now 23 in all we proceeded past New River (“Not new and not a river” as John always says). Through the lovely De Beauvoir area which is closed to through motor traffic which makes it a joy to cycle through. The pace was quite fast because, as John explained, Clara, the youngest member of the group was insisting he went faster and kept trying to go in front. 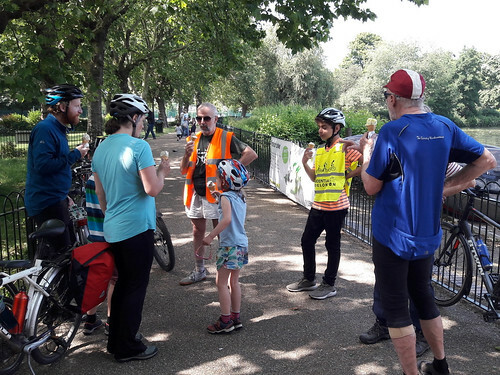 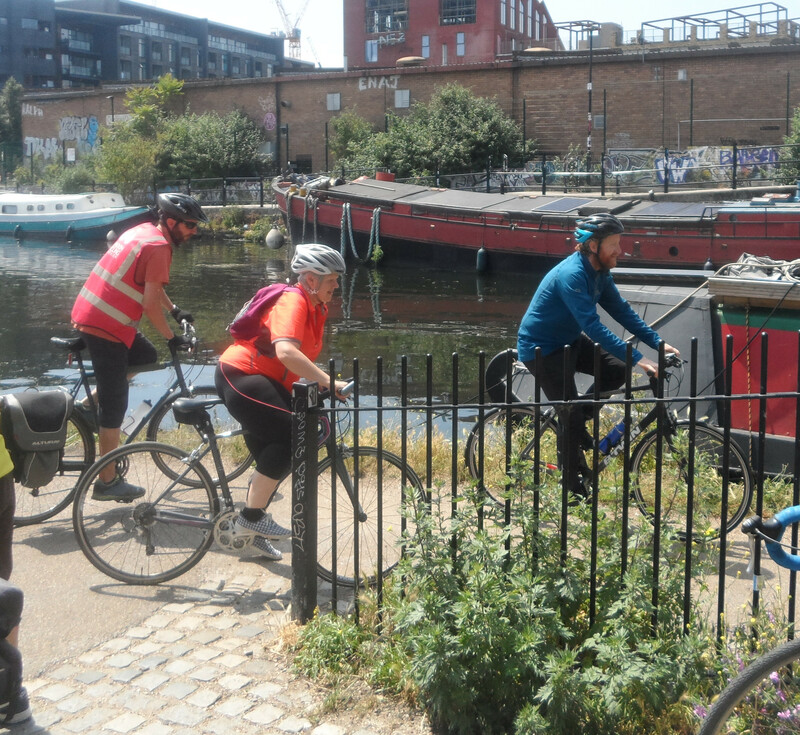 We went around London Fields and then followed the path of the Grand Union Canal into Victoria Park where we stopped for a break at the café near the skate park. 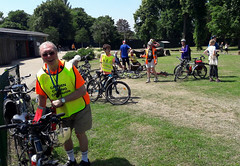 Unfortunately a puncture delayed a couple of riders but they were experienced and told us to continue without them and they would meet us for lunch. 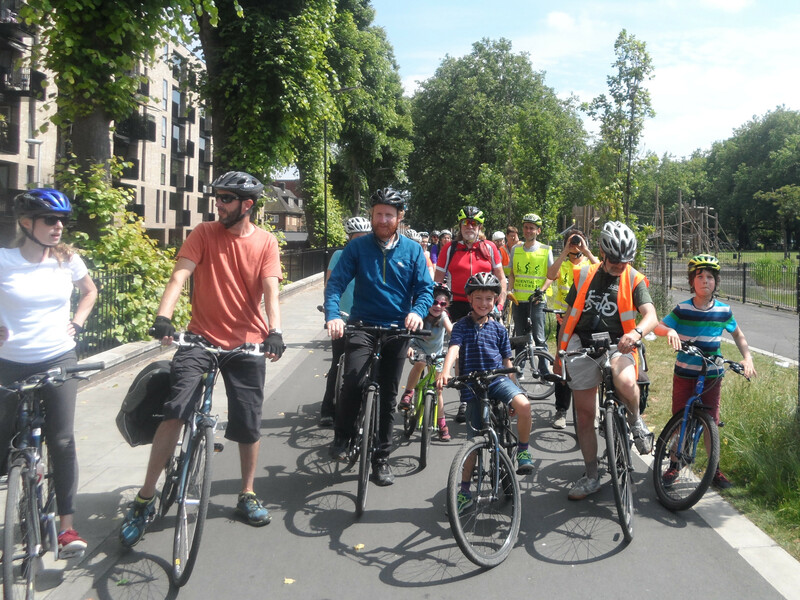 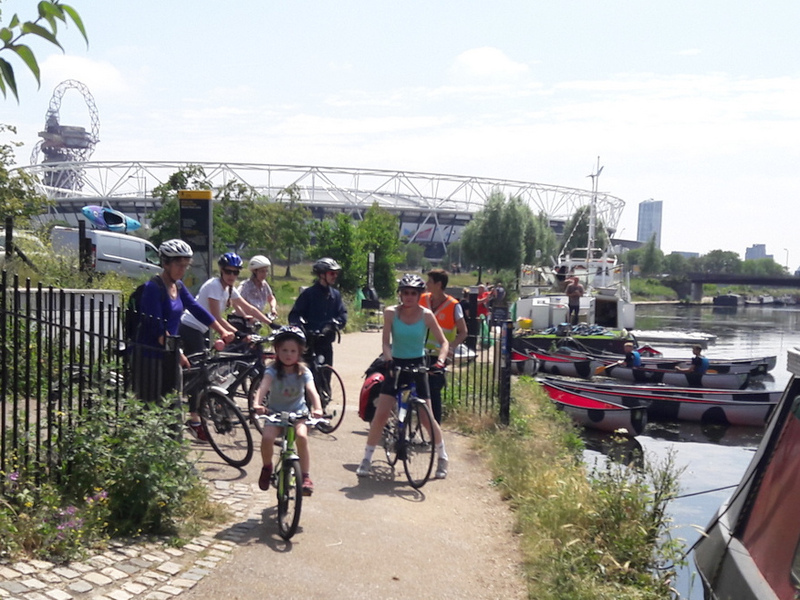 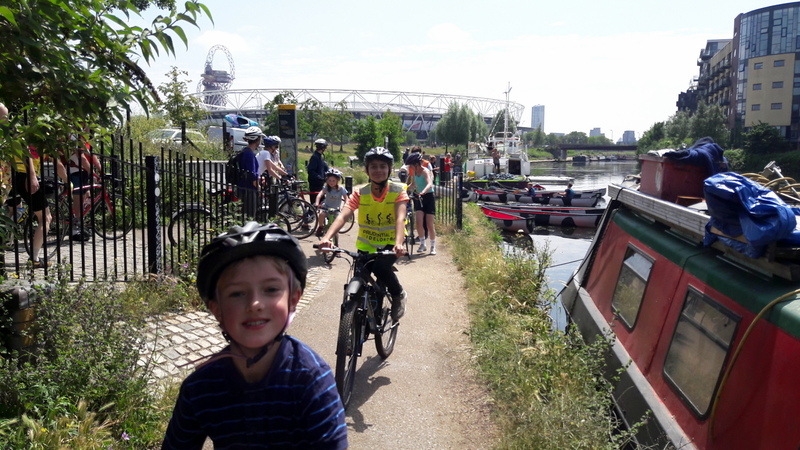 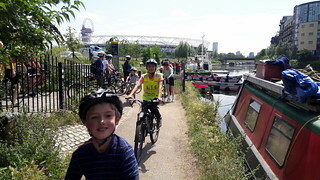 We continued out of the eastern end of the park skipping in and out of the two boroughs of Hackney and Tower Hamlets as we cross the A12 and down a slipway onto the Lee Navigation. 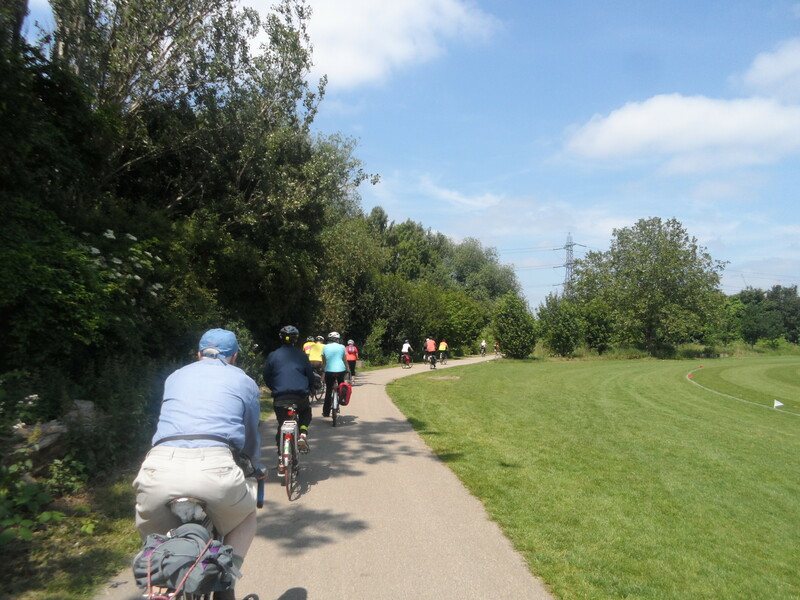 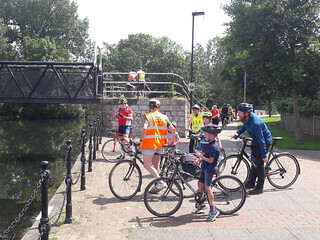 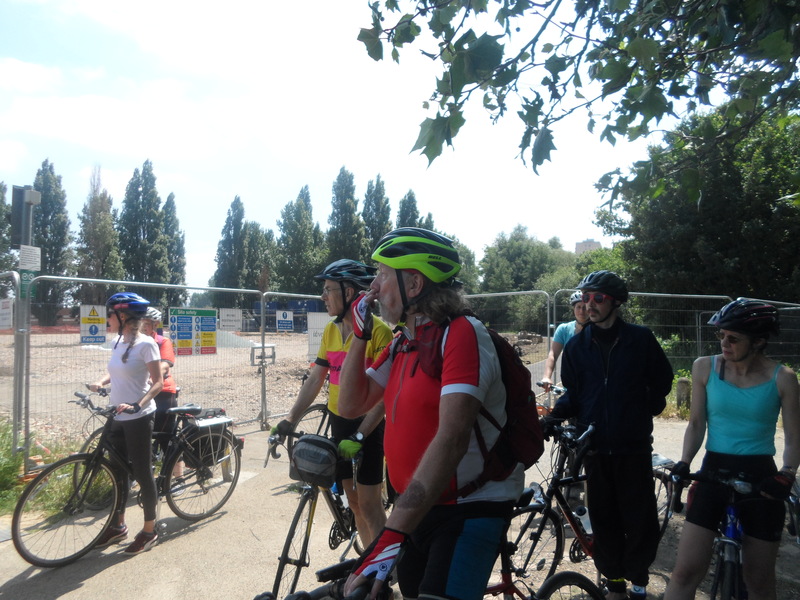 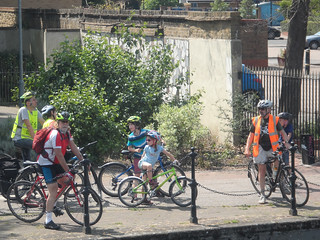 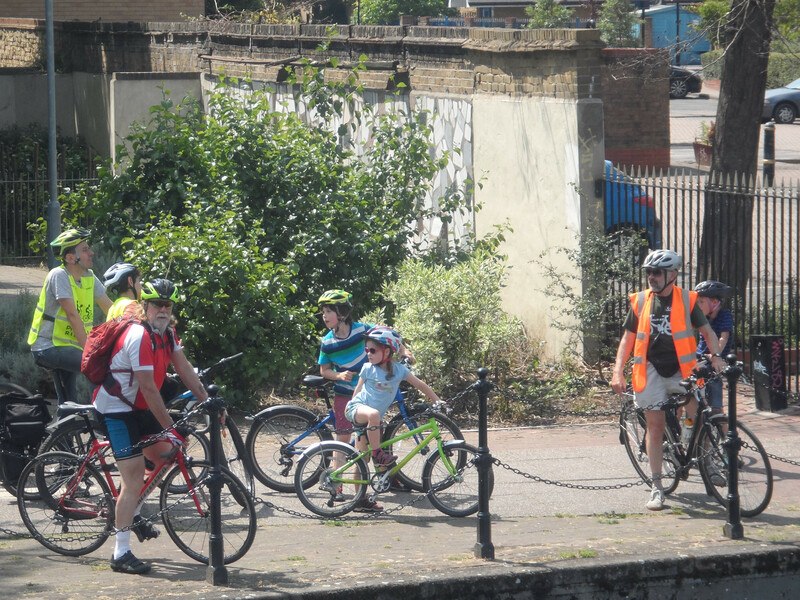 The towpath was very busy with both cyclists and pedestrians so we slowed considerably and the front half of the group became separated from the back half. As there was nowhere else to go except the towpath. When we did move away from the navigation the rest of the group had waited for us. 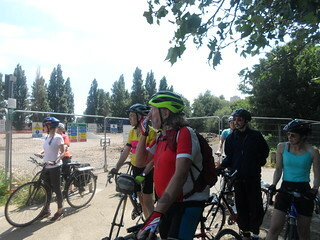 We had to go around a building site to get to our usual path but found our way successfully to The Waterworks Centre. 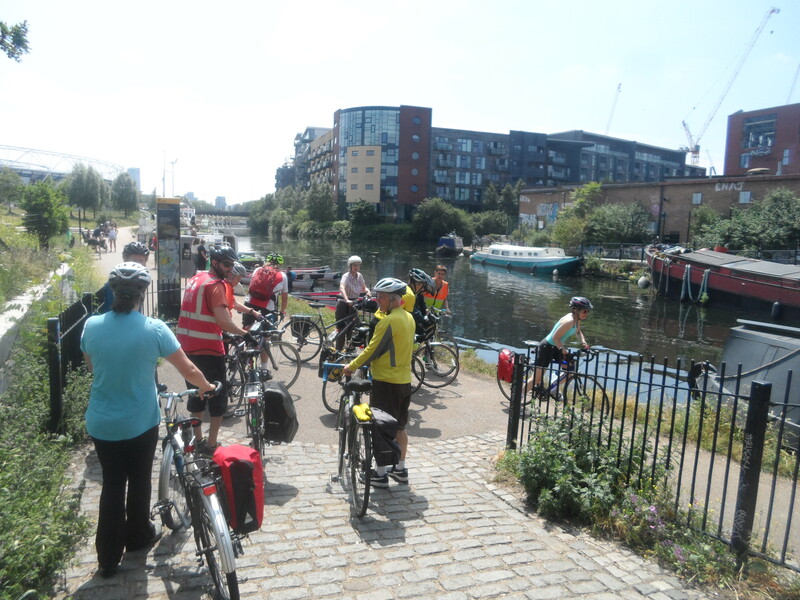 I’ve often wondered why there are two different spellings for the River/Navigation and I’ve just noticed, looking at the map, that they are labelled differently: The Lee Navigation and The River Lea. 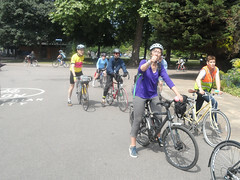 However, Maps can also be wrong! At The Waterworks Centre there is a little café. 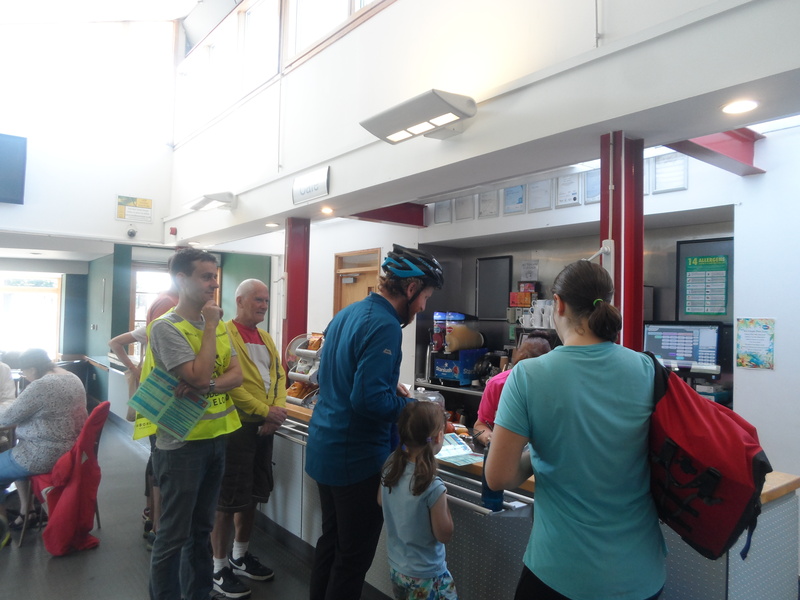 With only one person handling the orders and the till and making coffees it was quite slow progress getting our food. 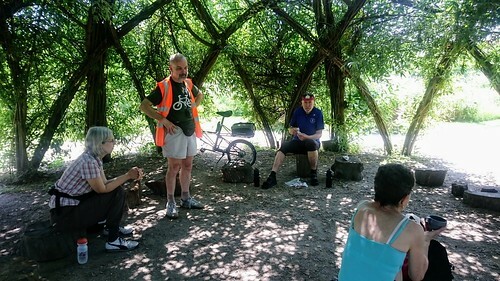 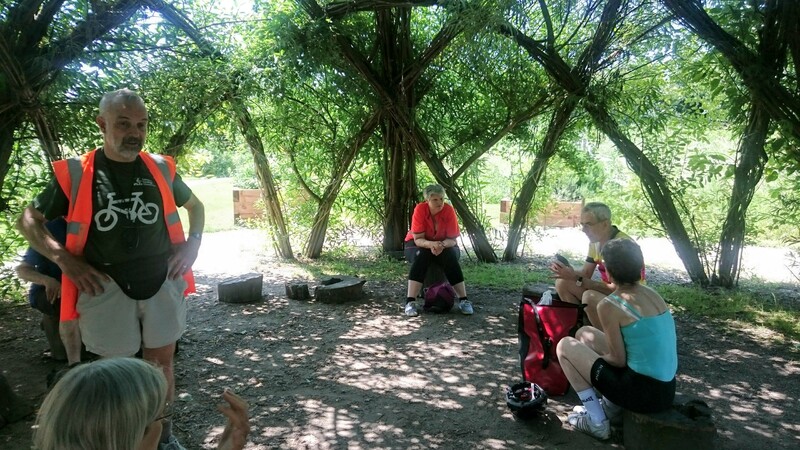 Many of the group had brought their own lunches so they also took some time to visit the water filtration beds which are now kept as a conservation area and one can open panels and observe the wildlife there. 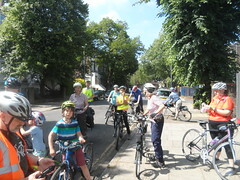 When we were all gathered at the appointed time we headed back to the Lee again and continued north. 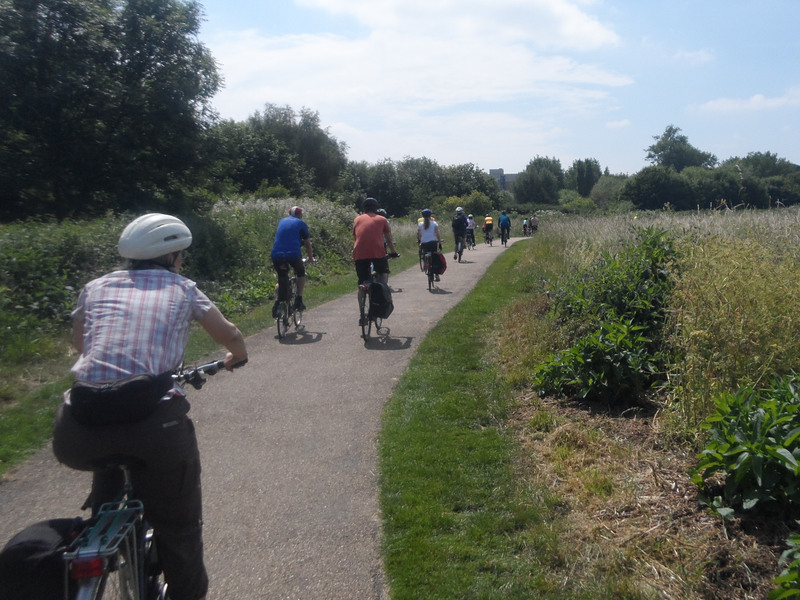 This part of the Navigation has a wider towpath and fewer pedestrians so we made faster progress. 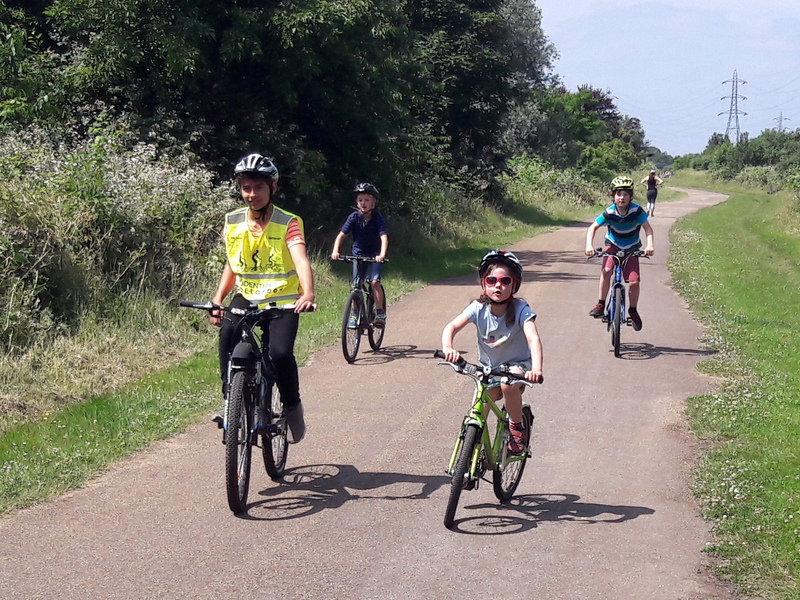 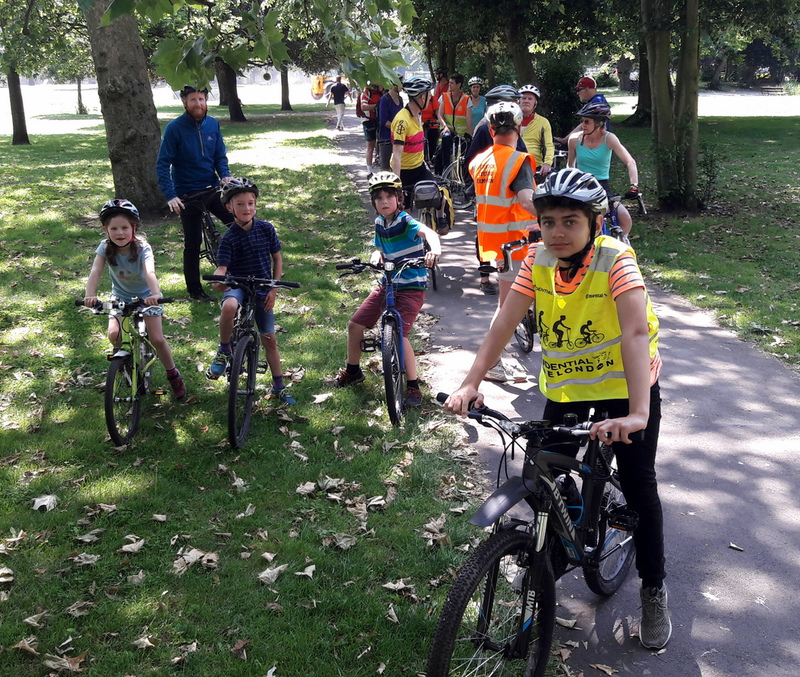 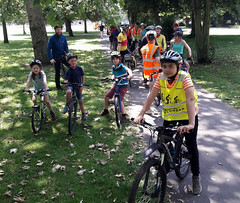 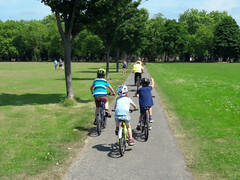 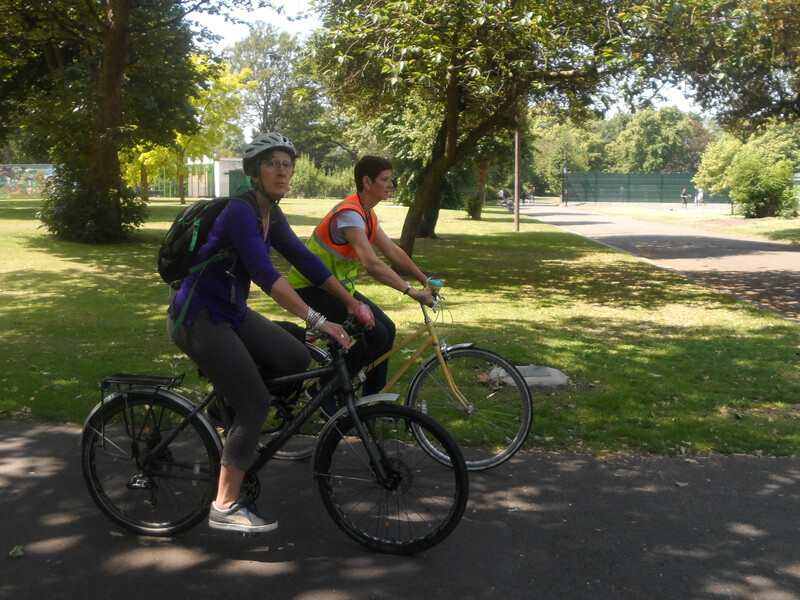 We head west and away from the navigation at Springfield Park where there is the steepest hill on the ride which slowed some of us down a bit. 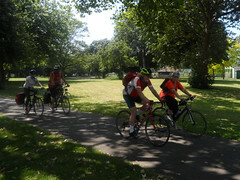 We cross Clapton Common and through the Stamford Hill area to Finsbury Park. 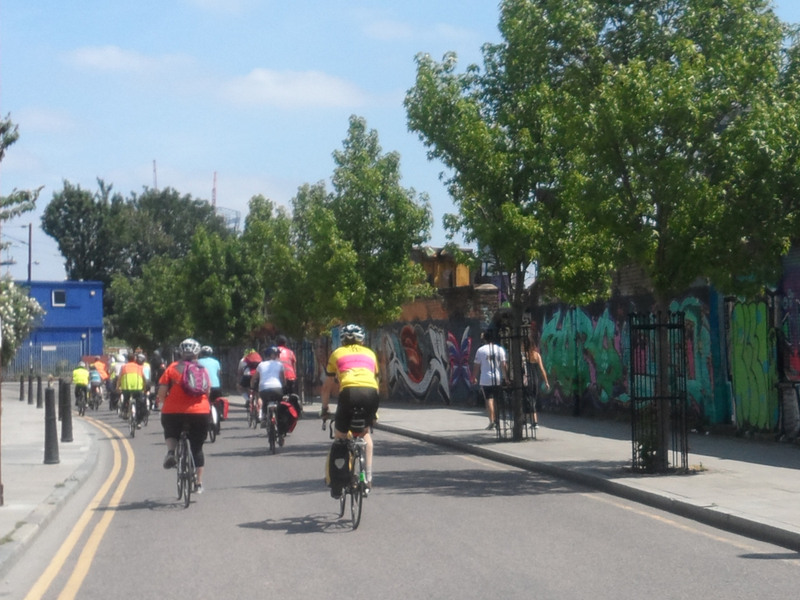 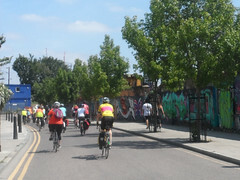 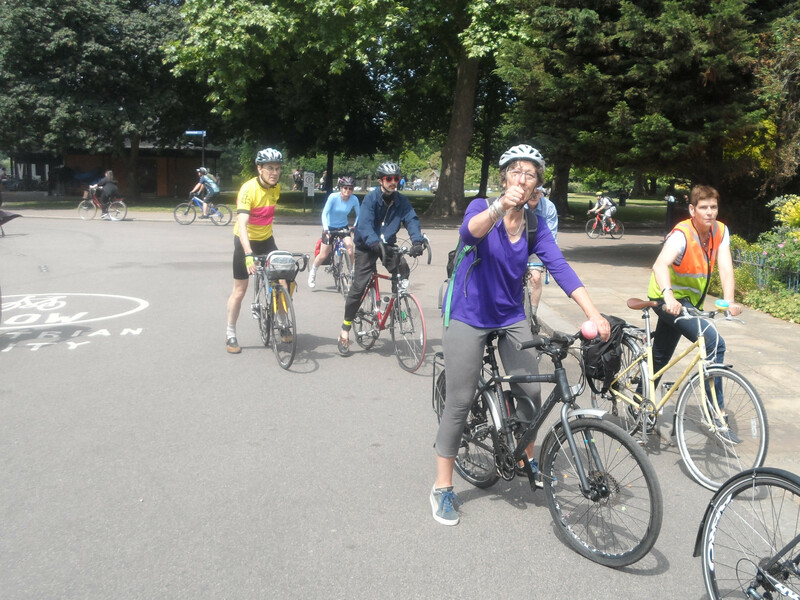 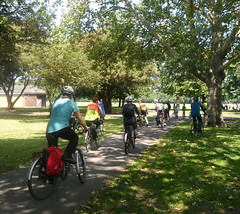 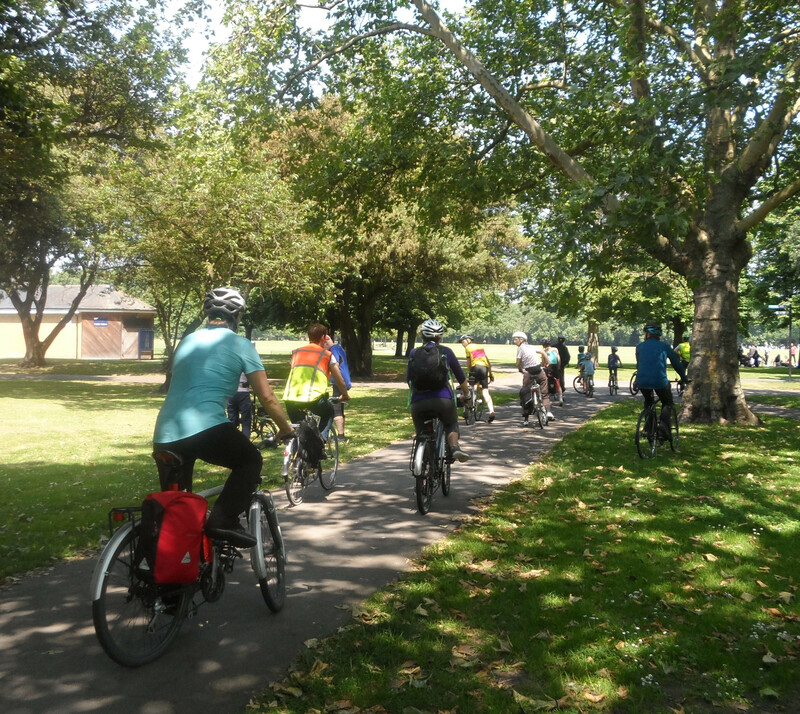 Crossing the Manor House junction into Finsbury Park is one of the busiest parts of the ride. Two very busy roads, Green Lanes and Seven Sisters Road cross here. 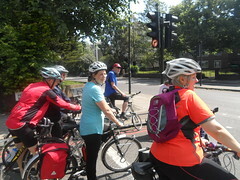 We don’t actually ride across, we all dismount and cross the junction at the lights. 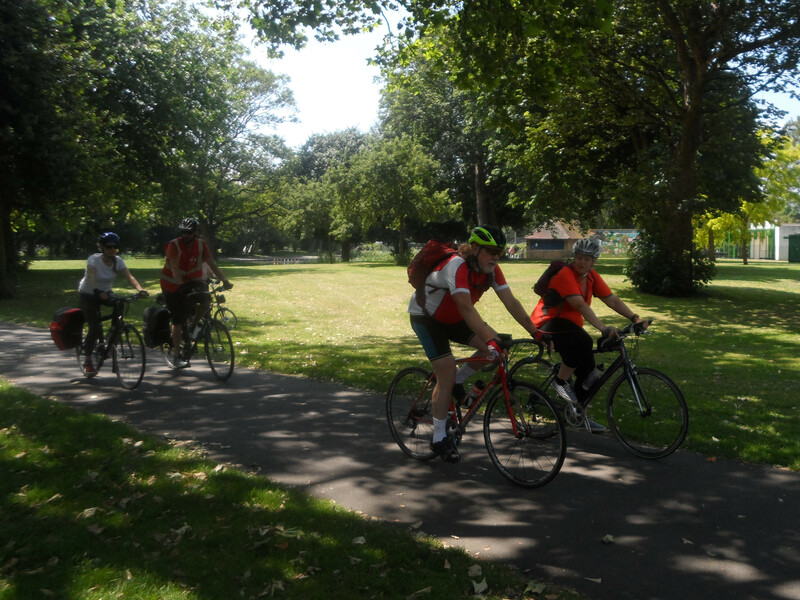 Finsbury Park is our afternoon comfort stop. 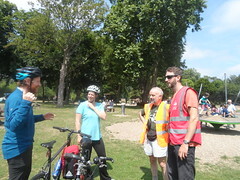 Here we can relax after that awful junction with an ice cream which is the usual food of choice here. Many of the Islington group left us here as they were closer to home. 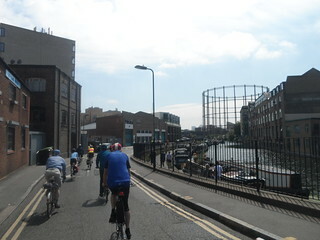 Exiting Finsbury Park over a railway bridge we turn right onto The Parkland Walk. 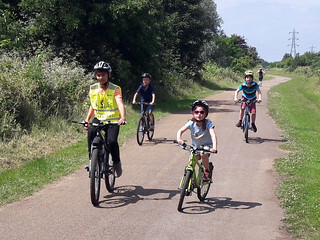 This was once a railway line but is now a lovely woodland walk and cycleway. 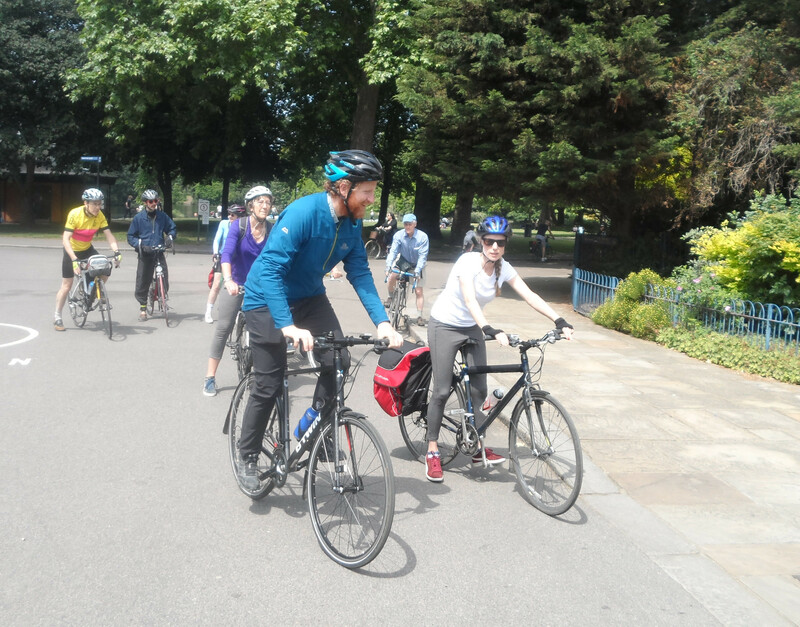 This curves and rises gently all the way to Highgate. 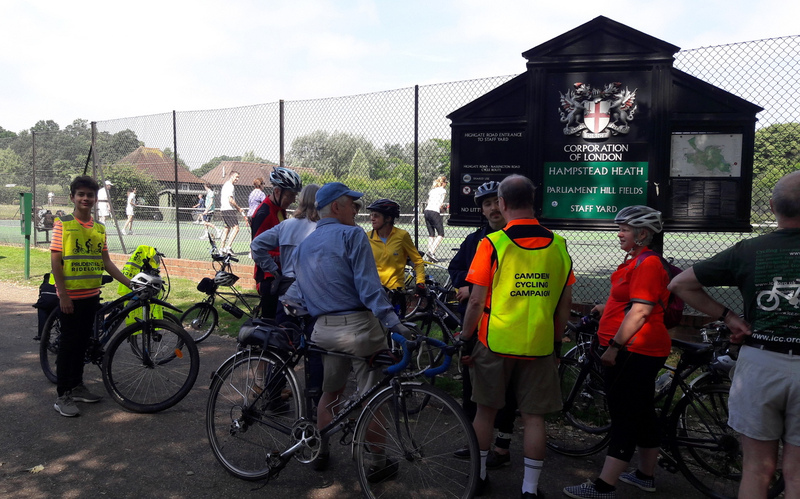 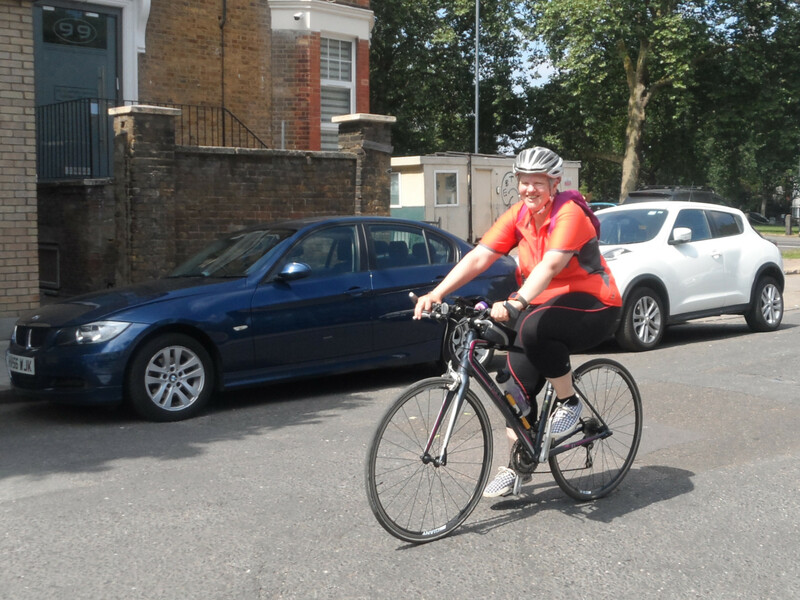 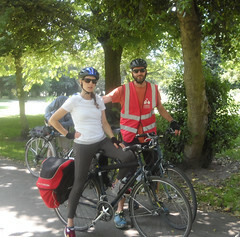 We don’t go as far as Highgate but come off at Crouch End, down through Elthorne Park and Whittington Park and back to our second starting point at the Hampstead Heath tennis courts. 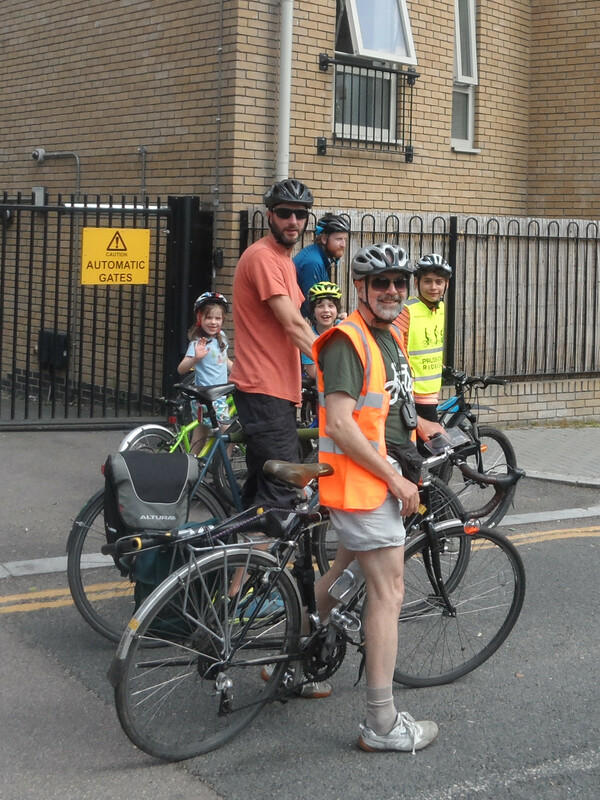 Here Morten, Oliver and I said goodbye to the rest of the large group and retraced our way over Hampstead Heath and back to Sidings via Swiss Cottage. 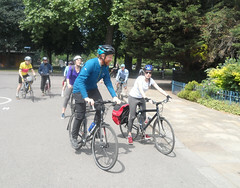 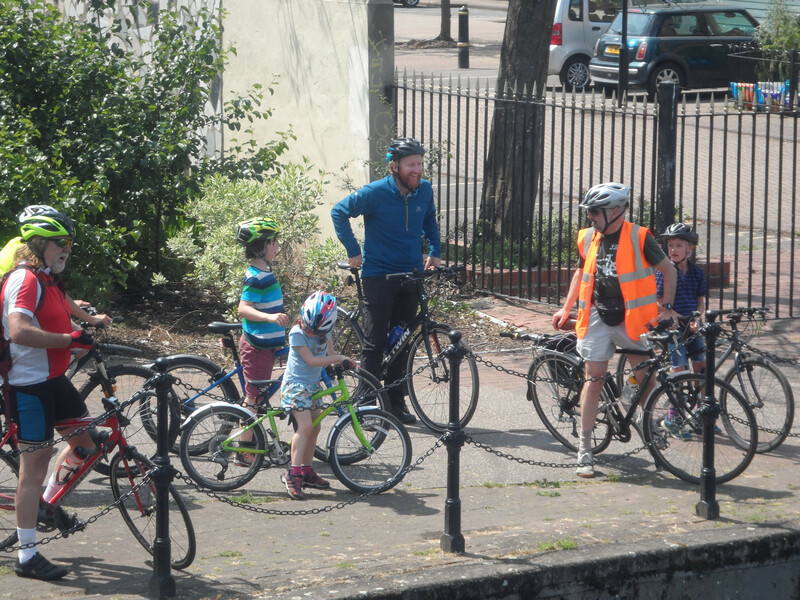 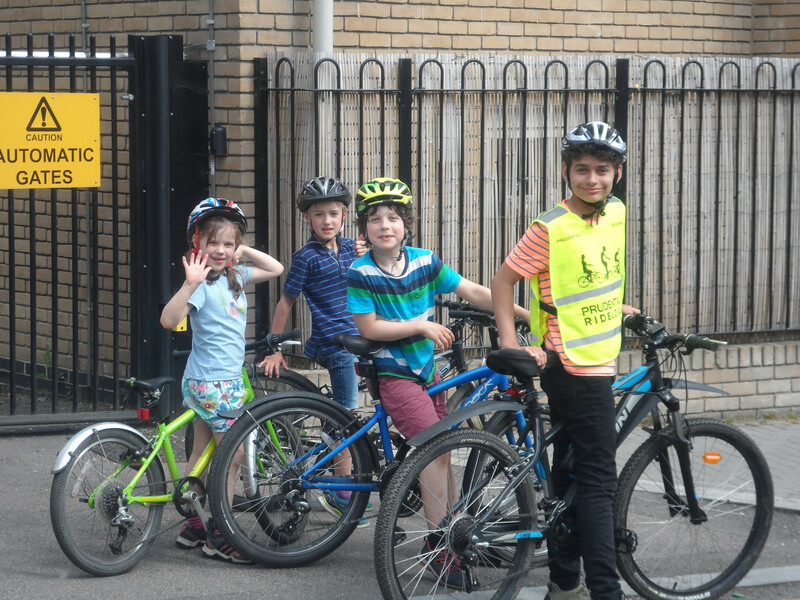 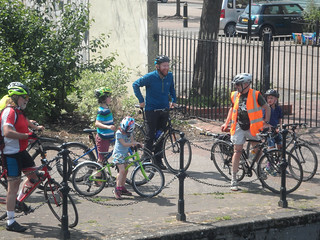 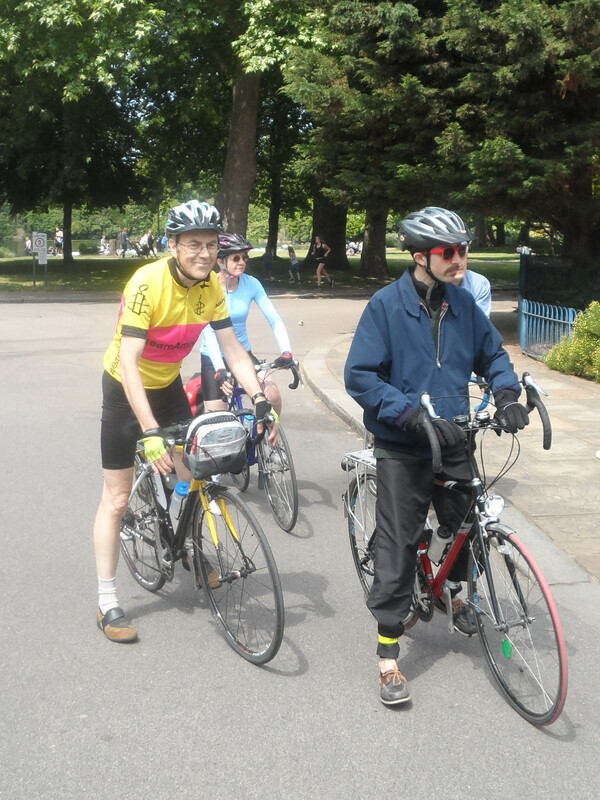 It was so gratifying that the young people all cycled together much of the time and got on so well. 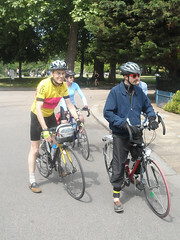 They set a great example to us all of how to have fun while out on a bike. 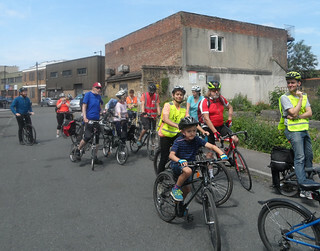 But we all had fun.